excitement as Animal Kingdom wins the Kentucky Derby! Now that you have perused the information available on Team Valor’s website and are interested in getting started, you might ask "What is the next step?" Request an information package of a specific horse being offered by Team Valor. Ask to be placed on a special list to receive an e-mail every time a new racehorse is offered by Team Valor. Ask to speak directly with Barry Irwin, president of Team Valor, by phone at 859-873-1003 or you may email Barry@TeamValor.com . Ask to be provided with the phone number(s) of a current Team Valor participant(s) in order to question him about his experience with the stable. The Team Valor Marketing Pledge is our promise to those considering joining a Team Valor partnership and what you can expect from us in the days ahead as you contemplate entering the world of racehorse ownership. Take a few minutes to compare Team Valor International with other horse racing partnerships. You can use OwnerView.com to compare statistics and accomplishments. Also check out each Syndicate's Stakes Record for the last decade at this link. Q: Do you charge a management fee? A: No. We used to, but we dropped it. Q: How is Team Valor compensated? A: Team Valor is compensated in three ways: a) it marks up a horse prior to syndication; b) it receives 10 percent of profits upon conclusion of the investment and c) it gets a 5 percent sales commission when a horse is sold. Profits are defined as the difference between all monies in vs. all monies out. Q: Does Team Valor deduct any of the purse earnings for its own account? A: No. Some stables do this. We never have, never will. Q: Do you maintain an equity interest in any of your horses? A: Yes, every one of them. Some are minor, some are medium, some are significant. Q: Have your clients made money with their racing investments? A: Because financial gain is not the primary reason participants become involved in Team Valor racing ventures, the question really should be, "Have your clients received value for their racing investment?" The answer to that question is, "Most certainly." If the goal of Team Valor and its participants was to make money and the stable was operated as a business, horses would be sold on a timely basis. However, investors in Team Valor racing ventures participate because they want to consume or use the product, not buy it for resale. If "value" represents quality involvement by participants at the highest level of racing, then Team Valor investors have received it. Q: How are expenses for training, etc. handled? A: Team Valor bills actuals in arrears bi-monthly. Q: How are earnings distributed? A: Purses are paid within 7 days of receipt of funds from a racetrack. Within a week, owners of a winning horse receive a package containing a disbursement check, a video tape of the race, winners’ circle photographs and press clippings if any. Q: How often are LLCs formed? A: Partnerships are formed on a regular basis throughout the year. Q: How many LLCs does Team Valor form in a year? A: Between 15 and 20 a year. 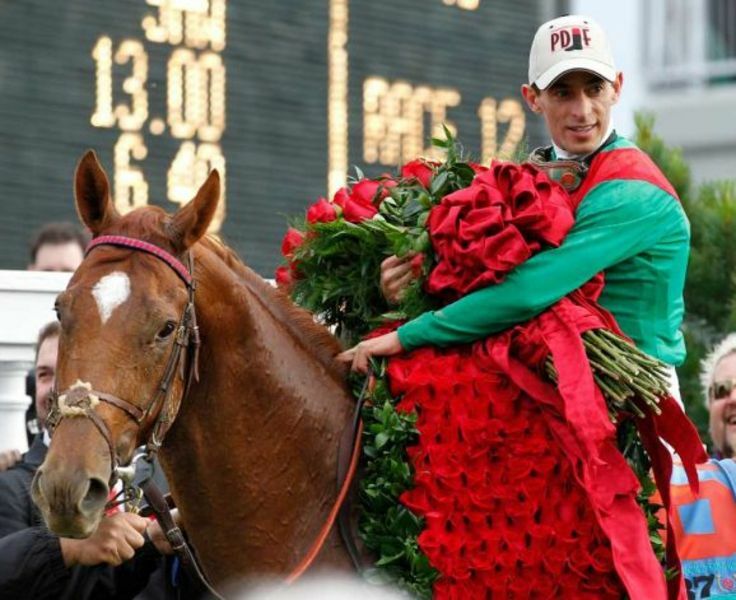 Q: What is the cost of a Team Valor racehorse? A: Between $120,000 and $2,000,000. Q: How many members are in each LLC? A: Usually between 6 and a dozen, from virtually every state in the country. Q: In what dollar increments are investments made in a partnership? A: From a low of $6,000, with a median of $15,000 and as high as $100,000 to $150,000. Q: Is it wise to put a lump sum in one horse, or spread it around? A: We always suggest diversification as a means of reducing risk. It is better to participate at a smaller level on three horses than to take a larger part of one. Q: Do you sell packages or groups of horses? A: We have very high and demanding standards. We have difficulty finding horses to buy on a one-by-one basis, let alone in groups. However, occassionally in North America, we will do a package of yearlings; and in South Africa, we annually do a package of yearling fillies. Q: What types of horses do you buy? A: While Team Valor has realized Grade 1 success with various types of animals, it generally concentrates on three kinds of racehorses: a) young horses that have run a time or two, b) yearlings and c) thoroughly proven runners. Q: Do you ever form partnerships with horses that Team Valor has bred? A: Yes, in recent years, as Team Valor has retained some of its top fillies and mares to put into production, Team Valor will occasionally offer the cream of its yearling crop as part of its special "Newcomers Program." Team Valor offers attractive terms and pricing on these partnerships in an effort to encourage participation from first-time racing enthusiasts to the stable. The first two of these partnerships were comprised of Pluck ($1-million Breeders' Cup Juvenile Turf) and Sailor's Cap ($600,000 Colonial Turf Cup). Q: Do you buy 2-year-olds at the in-training public auctions? A: Rarely. We stopped doing that in 2006 and did not return to the juvenile market until 2019, because we think that the consignors all too often compromise the horses, either physically or mentally, to achieve the fastest breeze. Q: Are you buying more yearlings nowadays? A: In North America, we are supplementing our racehorse purchases with a combination of adding our top home-breds and a few yearlings purchased at public auction. In South Africa, however, where horses are raised in a more natural environment, with less manipulation to their front limbs and excessive sales preparation (i.e. fattening them up like hogs instead of keeping them trim as an athlete), we buy a full spectrum of yearlings each year. Q: When you offer a horse for sale, what time constraints are involved? A: Once a horse passes our "due diligence" of scrutiny and is bought, it generally sells very quickly. Potential partners are always advised to be prepared to commit soon after a review of our package, documentation and a video tape of the horse. Since Captain Bodgit was syndicated in 1997 in 24 hours, most of our popular young horses sell out in a day or 2. Newcomers have to be prepared to respond fast. Q: How do potential investors find out if a horse is being offered? A: Team Valor maintains a list of prospective partners, with notes on what type of racehorses they are interested in, such as fillies vs. colts, young horses vs. proven horses, grass horses vs. dirt horses, West Coast vs. East Coast, etc. Once a horse is bought, Team Valor releases details of the acquisition on its website in the Headline News section and prepares promotional materials, which it sends out to prospective partners. Q: How many new investors generally participate in each LLC? A: Usually there are only a couple, because our regular clients react quicker than the prospective clients, who as a rule are not in the habit of responding as quickly as is required. Q: Is it safer to buy a filly vs. a colt? A: The difference between buying a filly vs. a colt is one of risk vs. reward. Fillies are generally a safer investment because they can have residual value as a broodmare. But the upside of a filly is restricted. A colt is riskier because if it is unable to realize its potential on the track, it has much less value than a comparable filly. However, the potential reward in owning a colt that becomes successful is many times greater than that of a filly. Q: What kind of "perks" can I expect. A: Free admission and seating on race days. Access to the Paddock (pre-race) and WInners' Circle (post-race). Access to seating for the Triple Crown and Breeders' Cup. Stable area access. Q: What about tax reporting? A: K-1 forms for each individual LLC and member are supplied prior to March 1 in each calendar year. Q: Are the horses insured? A: Team Valor routinely does not insure horses for mortality, with the exception of yearlings bought at public auction. Partners may obtain their own insurance. The Racing Manager maintains a liability policy in the amount of $3 million. Q: Why the Limited Liability Company format instead of a General or Limited Partnership? A: An LLC limits the liability of the members in case of a lawsuit solely to the assets of the partnership,so that its members are not personally liable or at risk. Q: Where do your horses train? A: Team Valor in 2011 formed a partnership to acquire a 40-stall barn that is the centerpiece of a training complex on the expansive acreage of the Fair Hill Training Center near Elkton, Maryland. Virtually all of Team Valor's horses use this as their home base from April to November. From November through March the stable is based at Palm Meadows in South Florida, a private training facility 45 minutes north of Miami. Q: Where do your horses race? A: Team Valor races horses mainly in North America. Every horse acquired by the stable is bought with the idea that it will eventually come to the United States. During the months of April through November, our horses race on the Eastern Seaboard (New York and Florida circuit) and the Midwest (Kentucky/New York/Florida). 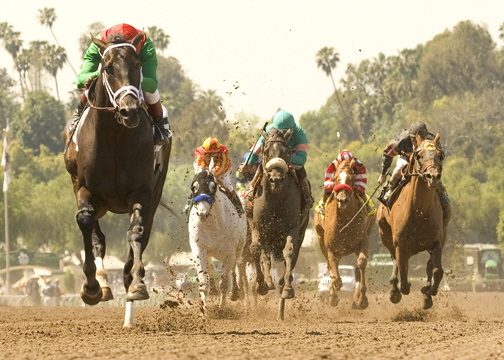 During the winter months, our horses race in Louisiana, Florida and California. Team Valor during the course of a typical year will race horses in the United States, Canada, Dubai, Hong Kong, South Africa, England, Ireland, France, Germany and Italy. Q: Where do the majority of your partners reside? A: While most partners live in the New York/New Jersey area; Chicago and surrounding suburbs; and Southern California, we have partners who live in Florida, Maryland, North Carolina, Pennsylvania, Rhode Island, Missouri, Louisiana, Arkansas, Hawaii, Arizona, Oregon, Washington, Connecticut, Kentucky, Ohio, Oklahoma, Texas, Colorado, Indiana, Tennessee, Delaware, Michigan, Wisconsin, Nevada, Massachusetts, New Hampshire, Kansas, Utah, Virginia, Minnesota, as well as Japan, Singapore, Korea, South Africa, England and Canada. Q: How are the partnerships concluded? A: Fillies and mares, in the vast majority of instances, are retired to a breeding farm, where they are bred and sold at the Keeneland Breeding Stock sale in Lexington, Kentucky in November of the first year in which they get in foal. However, occasionally, some fillies and mares are retired and placed into Team Valor's select band of retained broodmares, whose foals are both offered for sale at public auction as yearlings or syndicated for racing purposes and placed in Team Valor's stable. Colts that are exceptional are sold or syndicated as stallion prospects. Males not good enough to go to stud generally are sold privately or placed in good homes, where they become riding or sport horses. Q: Can an investor extricate himself/herself from a partnership before it is concluded? A: Because Team Valor offers no secondary market, an LLC member interested in selling a partnership interest must find his or her own buyer. Prospective participants should be prepared to be involved for the life of the investment. Q: Have any Team Valor investors ever gone on to have success with their own runners? A: Yes, two of our former clients have gone on to Breeders' Cup victories. 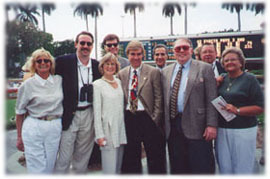 Former Mattel CEO John Amerman and his wife Jerry won the Breeders' Cup Distaff in 2003 with Adoration. 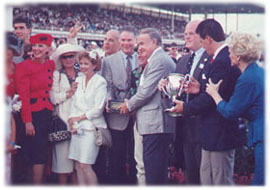 Barry Fey won the Breeders’ Cup Sprint with Reraise. Q: How much does it cost to train a horse with Team Valor? A: When all is said and done, it costs about $65,000 annually to have a horse in training with our stable. All of the costs incurred by our horses are "passed through" directly to our owners--nothing extra is added on. The figure cited includes all training, normal veterinary work, blacksmith, vanning, accounting and tax prep. If a horse runs in stakes races, additional costs are incurred for nominations and entry fees. Q: Do investors have any input as to the campaigning of a racehorse? A: Those who participate in a racing venture do so because they are interested in benefiting from the expertise of Team Valor, not of the other members. Q: Do partners have a say-so in determining anything? A: Yes, partners vote on important issues regarding the expenditure of extraordinary sums of capital, as well as when a venture should be terminated. Q: Has Team Valor raced in partnership with any prominent members of the Thoroughbred industry? A: We have raced stakes winners with Robert Clay (Three Chimneys Farm), Bill Casner and Kenny Troutt (WinStar Farm), Will Farish of Lane's End Farm, Antony Beck of Gainesway Farm, Gaynor Rupert of Drakenstein Stud in South Africa, Richard Santulli (NetJets), Margaux Farm, Bill and Corrine Heiligbrodt, Denali Stud, Green Lantern Stable (Richard and Sue Ann Masson), Henry Mast, Gary Barber (MGM Motion Pictures), Barbara Lacroix of Meadowbrook Farm, NeverTell Farm, Carl Pascarella (inaugurated Visa Triple Crown bonus), Dr. Chuck and Dr. Nancy Kidder of Corner Woods Farm, James L. Mamakos, Peter and Eloise Canzone, Brandon Perry and John Stephens (Vision Racing), Syd Belzberg, Dave Munro of Highfield Stock Farm in Canada, John Henderson; stakes horses with Taylor Made Farm and Ian Balding (England); and raced other horses internationally with Larry Nestadt (South Africa), Anant and Vanshree Singh (South Africa), Scuderia Siba (Italy), Juan van Heerden (South Africa), Robert Bloomberg (South Africa), Greg Blank (South Africa), etc. Q: Is it true that half the horses raced by the stable are stakes horses? A: One in every two starters for the stable earns black-type in a stakes race. This has been the case for more than 20 years. Also 27 percent of all of the stable’s runners have won stakes races. Q: How do you keep partners informed? A: Former Daily Racing Form columnist Barry Irwin twice weekly writes the Insider's Bulletin, a private memorandum accessible only to Team Valor investors, who can access the report by using a pin system to enter a private sector at the company’s website. Letters to partners are sent when appropriate. Our ability to communicate with our partners is the envy of the industry.